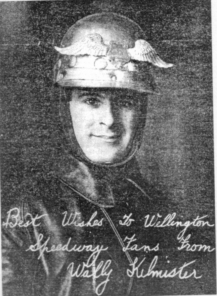 Wally Kilmister was a rider at Taita and Kilbirnie tracks in the early days of New Zealand Speedway. Here are some notes about him taken from early speedway program. Return to Personalities. “The man who was the star of Wellington’s first motor-cycle speedway, at the Kilbirnie Stadium about 40 years ago, and then went on to win international honours in his sport, died recently in Rotorua. He was former Karori boy, Wally Kilmister”. “Mr. Kilmister had not lived in Karori for many years but in his day he was one of the best known former pupils of Karori School. He died in Rotorua, at the age of 65, after a long illness. He had been in the light engineering business in Taupo for several years. “Wally Kilmister rode his first motor-cycle races at the age of 17, while he was an apprentice mechanic, in the mid-1920’s. In those days the races were held on grass, usually racecourses, and the riding technique was quite different from that needed for the loose cinder surfaces of the prepared speedways, which came into vogue in the late 1920’s. Speedway and now resides in Southwards Museum.